Bunny Shapiro is the name of a local jewelry, accessory, clothing and art boutique located in colonia Emiliano Zapata, whose unique handmade bracelets and necklaces had recently caught the attention of international media outlets. The October 2016 printed editions of the American fashion and beauty publications Cosmopolitan and Seventeen Magazine featured some of its pieces in an editorial spread. The shop takes its name from its owner, Bunny Shapiro; a canadian designer who worked for the New York’s fashion industry for over ten years and suddenly decided to quit her job and move to Puerto Vallarta. “They found me on Instagram out of nowhere”, she said when we asked about how those magazines reached her. Shapiro is a graduate of the New York Fashion Institute of Technology and the University of Western Ontario Canada. During her time in New York, she worked as a display designer for Bloomingdale’s—a luxury department store owned by Macy’s—and for other brands such as Ralph Laurent and Chanel. “In November 2015, I decided I wanted to move somewhere warm, tropical and maybe teach English. I had visited Tulum with a friend and was amazed by the beauty of Mexico, all the colors and people who live in this nation. So I looked for opportunities as an English teacher in this country and subsequently moved to Puerto Vallarta”, Bunny explains. 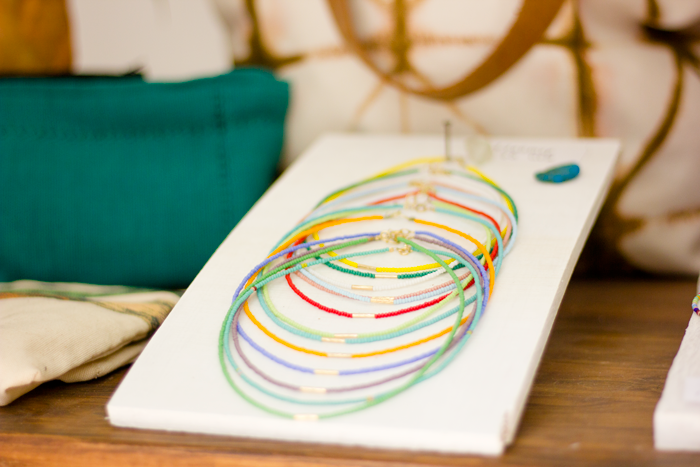 A few months after her arrival, she stumbled upon a beads supplier and started making bracelets and necklaces. Very quickly, acquaintances, family and friends started buying up Bunny’s pieces, so she decided to develop her jewelry line and start an online business. Thanks to the success of her accessories, she opened her boutique in July 2016. We recently discovered all the one-of-a-kind items available at her lovely boutique—including art works and pieces from other local artists and suppliers—and didn’t want to miss the opportunity to give you a glimpse of its offerings. Bunny uses Shakira and glass seed beads to make her bracelets and necklaces. The silver pieces she puts together in her designs come from a local silversmith. Bunny describes her line as a kaleidoscope of colors. Stones are also an important element of her jewelry line. Cosmopolitan editorial spread featuring a Bunny Shapiro necklace. Seventeen Magazine editorial spread featuring a Bunny Shapiro necklace. Woven handbags by local designer Lucinda Flippen, available at the shop. Vintage pillows by Lucinda Flippen. These are made with Oaxacan fabrics from the 1970’s. Decorative atrapasueño (dreamcatcher) by local artisans Iván and Rosario Gómez. They collect wood, feathers and stones from the jungle and use them to make this charming pieces. Hand-painted, ceramic pots by Bunny Shapiro. For more information about Bunny Shapiro boutique, please visit its Facebook Page, Instagram feed or website.